Wanting to get into some great manoeuvres on your landboard? The Peter Lynn Twister 2 (II) is a great kite for you if you want to get into some cool jumps and transitions while having an easy going kite. Wanting to get into some great manoeuvres on your landboard? The Peter Lynn Twister 2 (II) is a great kite for you if you want to get into some cool jumps and transitions while having an easy going kite. The Peter Twister 2 (II) is a very easy kite to use for jumping as the kite has been designed to lift in a large segment of the upper wind window. The kite does not need to be flown at a specific position in the wind window to generate lift, as you steer the kite the kite starts to lift very smoothly, making it easy for you to get some decent air! This gives you good control in your jumps to perform rotations or other tricks. Especially when landboarding, freestyle buggying, snowkiting or just power kiting. You can get some serious airtime with the Peter Lynn Twister 2 (II)! Whether you are on sand, snow, on a board or in a buggy, the Peter Lynn Twister 2 (II) is a great kite for people who want a kite with some good lift yet easy flying behaviour. The Peter Lynn Twister 2 (II) has good solid power through the wind window and has a stable and predictable behaviour. Constant Power: The Peter Lynn Twister 2 (II) has a solid pull throughout the complete wind window, making it more fun for the less experienced buggier or landboarder looking for some lift in a kite. After steering the kite down, it will accelerate slightly but not too much, making the kite easy to fly. Solid Power: Keeping you in full control at all times the Peter Lynn Twister 2 (II) delivers heaps of power for some serious airtime, either on handles or control bar, allowing you to push your own limits to the max. The Peter Lynn Twister 2 (II) really comes alive in the upper levels of its wind range when the full potential of this great kite can be experienced. Controlled Flying Speed: Because of it's medium aspect-ratio, the Peter Lynn Twister 2 (II)'s flying speed is remarkably fast while still having a stable and predicatable flying behaviour. The kite does not suddenly accelerate which is great for people wanting to improve their buggying, landboarding or snowkiting skills. The Peter Lynn Twister 2 (II) is a kite that responds well to both 2-line and 4-line control movements using a bar or handles. Steering the kite with 2-line control movements is easy when being less experienced with kite flying or when doing jumps. When you get into more advanced flying techniques the 4-line control movements make the Peter Lynn Twister 2 (II) fun and challenging to fly with a board or buggy. Even in lighter winds the Peter Lynn Twister 2 (II) flies well with good control from the kite flier. Good Lift: The Peter Lynn Twister 2 (II) features a good lift for easy jumps and transitions. The kite keeps a good pull at the edge getting you up in the air with ease. The lift combined with the predictable flying behaviour enables you to get your jumps sorted quickly and advance into some cool freestyle action! Stability: The Peter Lynn Twister 2 (II) is a very stable kite making it easy to get used to the kite's flying behaviour. When the kite flies over your head or past the edge of the wind window, the Peter Lynn Twister II does not collapse, but instead will drift back into the wind window. This predictable behaviour means you’ll be more confident and capable of dealing with the challenging conditions associated with gusty inland flying. Leaving you more time to enjoy the ride. Once you've got the feel with it, you can start to do some crazy tricks with your landboard, buggy, ski's or snowboard. Reinforced leading and trailing edges, along with the use of heavy duty material on the ribs, makes sure the Peter Lynn Twister 2 (II) is strong and robust enough to withstand hard ground impacts! Double sewn bottom skin and back-tacked bridle tabs ensure extra durability and strength, making certain the kite is reinforced where it's needed. The D-ribbed centre section of the Peter Lynn Twister 2 (II) increases the smooth, clean shape of the canopy to optimise speed and eliminate distorting without the use of extra bridles. 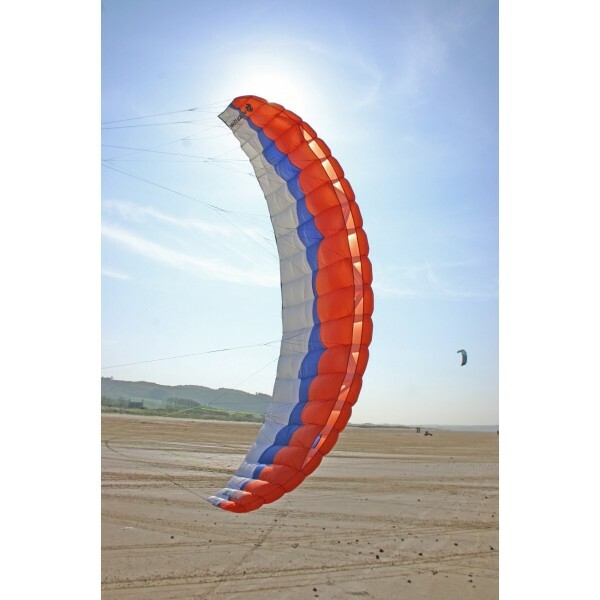 Each size of the Peter Lynn Twister 2 (II) has been specifically designed to keep the same flying feeling and characteristics throughout the entire range. The Peter Lynn Twister 2 (II) Velcro loops makes sure you can easily pack away your kite without the chance of bridles getting tangled. 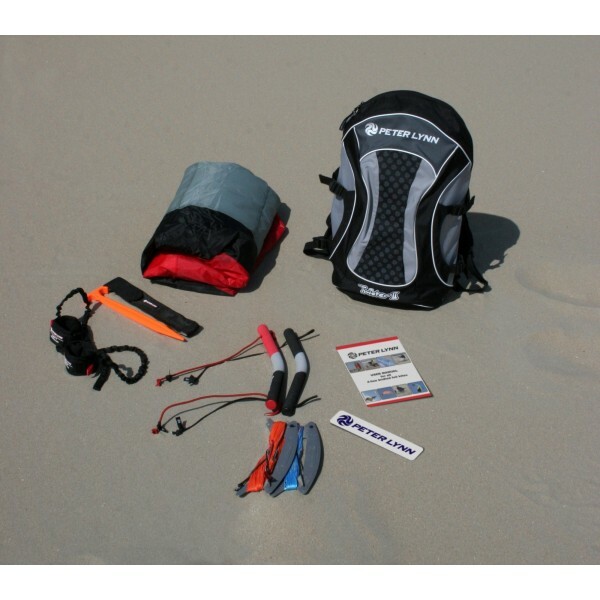 The Velcro outlets at either end of the kite also ensure you can remove any sand or dirt from inside the kite with ease. All this makes the Peter Lynn Twister 2 (II) the ultimate all-round performance kite. Each size comes in striking colour combinations with graphics on the top and bottom skin. Peter Lynn Twister 2 (II) Kite - complete with pre-sleeved bridles. Peter Lynn Twister 2 (II) Kite Storage Bag - Waterproof style rucksack with zipper and pockets. Dyneema Flying Lines - Pre-stretched flying lines. Colour-coded for safety and ease of use. Groundstake - A must for all power kiting traction activities allowing for quick peg-down of your kite. Complete with groundstake pocket. Peter Lynn Twister 2 (II) Instructional Manual - Sticker and Keyring. Optional control Bar for 2 line Kites like Peter Lynn Vibe Simply let go the bar and and safety wrist strap will prevent loosing the kite and the kite will drop out of the sky. Stay safe with these durable knee and elbow pads from HQ and Coolmax. These high strength and comfortable pads are made from specialized materials to help minimize sweating and heat while riding. Extra wide elastic fastening straps make these pads easy to put on and keeps them where they need to be. Sold complete including two knee pads and two elbow pads.